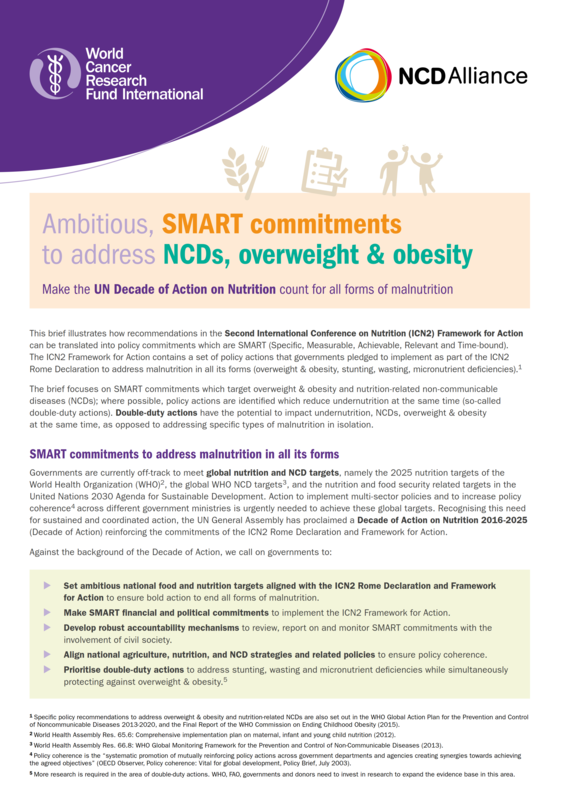 On the 23rd of May 2016, the World Cancer Research Fund International and the Noncommunicable Disease (NCD) Alliance launched a new policy brief on Ambitious SMART commitments to address NCDs, overweight and obesity. This brief illustrates how recommendations in the Second International Conference on Nutrition (ICN2) Framework for Action can be translated into policy commitments which are SMART (Specific, Measurable, Achievable, Relevant and Time-bound). The World Health Organisation 9 voluntary global targets, 6 objectives of the NCD action plan, and the 25 indicators of the Global Monitoring Framework. The nutrition and food security related targets in the United Nations 2030 Agenda for Sustainable Development. Action to implement multi-sector policies and to increase policy coherence across different government ministries is urgently needed to achieve these global targets. Recognising this need for sustained and coordinated action, the UN General Assembly has also proclaimed a Decade of Action on Nutrition 2016-2025 (Decade of Action) reinforcing the commitments of the ICN2 Rome Declaration and Framework for Action. The example policy commitments are accompanied by case studies from around the world.